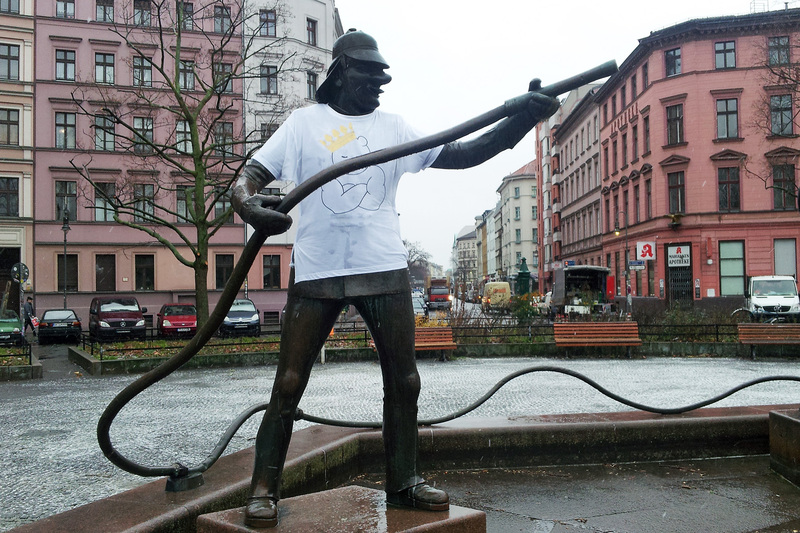 Guerrilla gardening, guerrilla knitting, now guerrilla t-shirting? 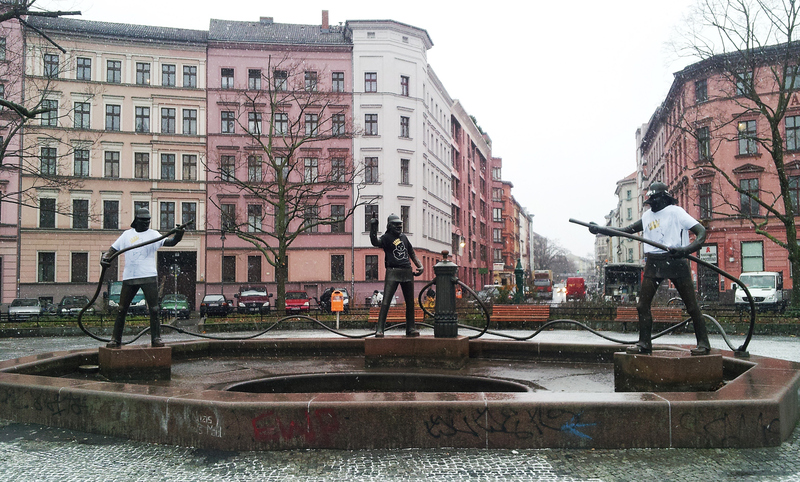 Is this a new Berlin trend in urban expression? We’ve had the locks on bridges, the bottle cap mosaics, the cool ceramic tiles, flower bombing… is graffiti passé? Oh definitely not. But the winter weather is now upon us – weather front Xaver dropping wind gusts and snow storms from the heavens, keeping kids from school and people from work. Well, it seems that someone has a heart and is giving statues in our neighborhood some warm cloths to weather the storm. 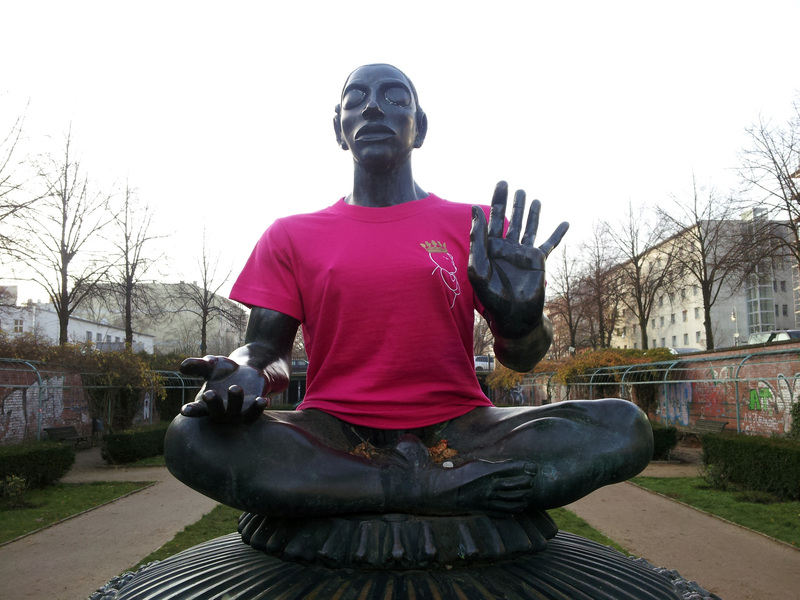 So it comes to pass that the Buddah of Kreuzberg (you can find this Buddah in female form in the appropriately named ‚Engelbecken Garden‘) gets a bright pink t-shirt sporting the Berlin icon Bear – who rather than meditating, is giving a muscle pose. 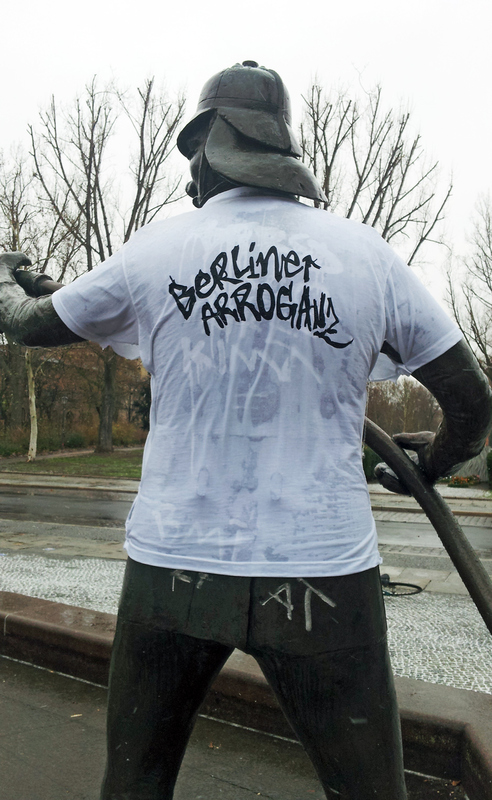 xhiller found a clue to the artists on the back of our deity – berliner arroganz – and it turns out that they are a neighboring T-Shirt company in Kreuzberg district 61. And delving a bit into the history of our beloved district, we find the story of the Buddah. This striking bronze statue is a replica of the original that was melted down by the Nazis in 1942. 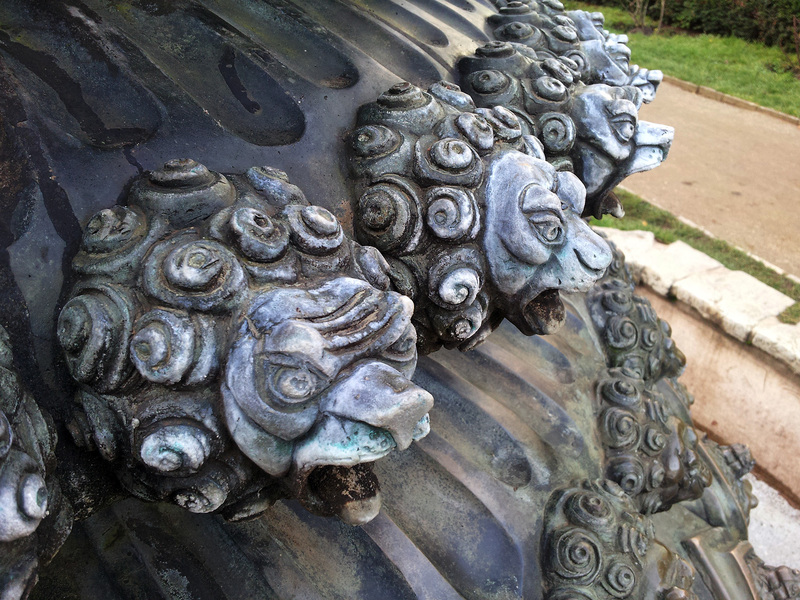 The figure sat atop the „Indian Fountain“. A fascinating story of the Engelbecken gardens can be found in the Kreuzberg Chronicles website (in German). 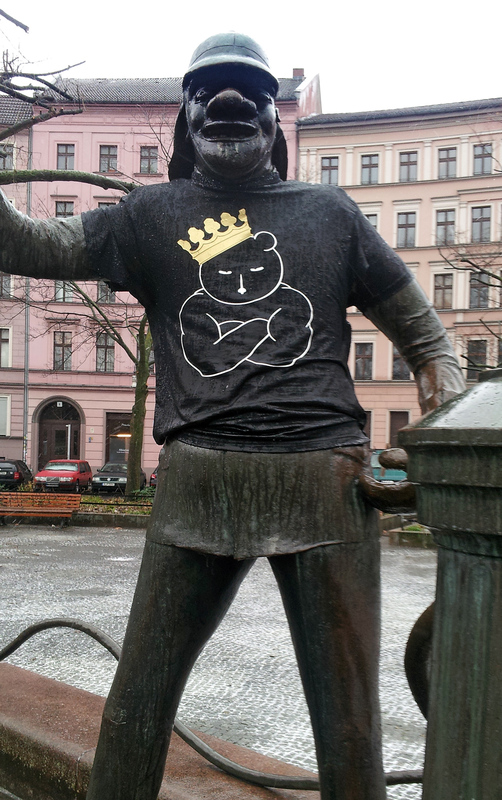 Not far from the Engelbecken (Angel Basin) we found some more T-Shirt action from Berliner Arroganz. 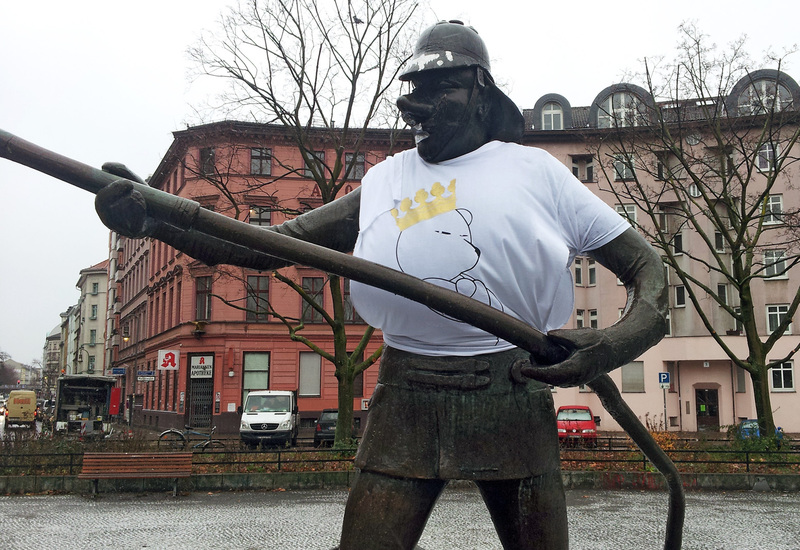 Here they are – the heroes of Mariannenplatz all decked out in spiffy threads.